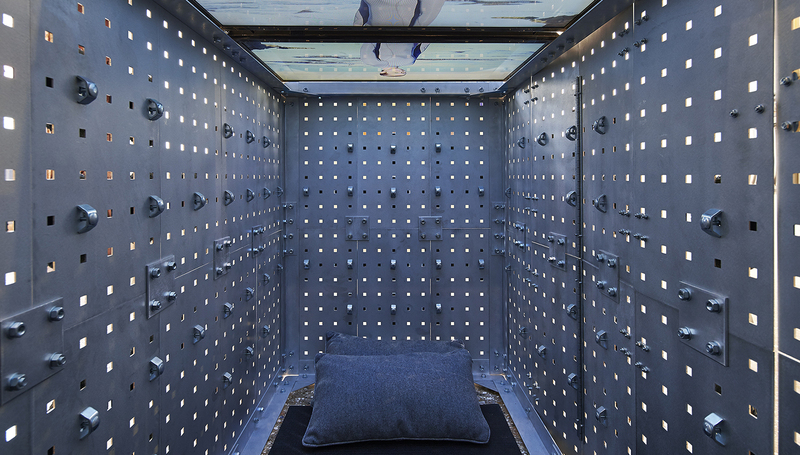 Join us at MPavilion for a twilight performance designed around artist and experimental architect Matthew Bird’s interactive MProjects installation, ‘An immersive encounter with the afterlife‘. This multidimensional installation—composed of a celestial field of reimagined ‘bells’, and which invites audiences to experience a performative encounter with the afterlife through chance interactions—renders Bird’s creative curiosities of esoteric and metaphysical space. This is the second in a series of commissioned performances interacting with the installation, in collaboration with composer Daniel Von Jenatsch, choreographic artist Phillip Adams and fashion designer Pia Interlandi. Over the course of its (after)life at MPavilion, seven local, emerging and established performers will activate the installation: Emma Riches, Tom Woodman, Rachael Wisby, Luke Fryer, Ben Hurley, Pia Lauritz and Timothy Walsh. This visual and sonic experience will transform MPavilion into a spirited and experimental instrument with the aim of creating a responsive, transcendent and nondenominational performance dialogue with the hereafter. Come down to the Queen Victoria Gardens to witness the performance and interact with the installation in person. The performance will run from 6–7pm, followed by an audience Q&A with Matthew Bird, Daniel Von Jenatsch, Phillip Adams and Pia Interlandi. Saturday 16 December, 3–4pm: Panel discussion with experimental architect Matthew Bird; astrophysicist and ARC Future Fellow, Daniel Price; architect and urbanist Charity Edwards; and architect and VR designer Tom Morgan.